I’m very happy to say that Day 1 of my Live Below The Line challenge is now complete. It’s not been much fun – and I’m sure the remaining four days will be worse. Breakfast wasn’t actually too bad. My breakfast normally consists of a huge cup of decaf coffee and a cigarette, so actually eating today was a bit of a novelty for me. One home made flat bread, spread with jam and with a boiled egg on the side set me back a grand total of 14p – a bit of a bargain! 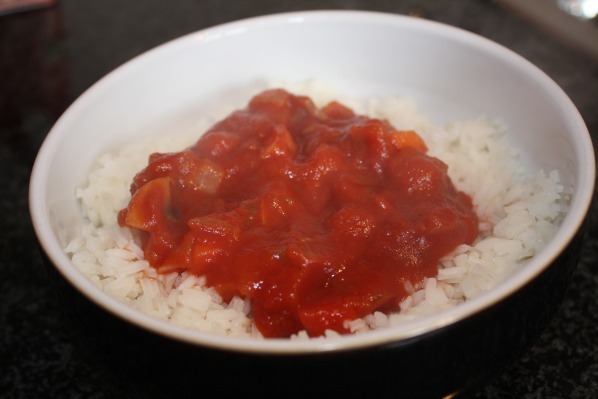 I spent this morning (I’m so glad it’s a bank holiday…) making a sauce from one carton of the passata, plus half of the mushrooms, carrots and onion. I divided this into five portions, the cost of each of which is 15p. One of these was today’s lunch, along with 100g of rice (a cost of 8p) – 23p in total for a lunch that was filling but not exactly inspiring. Monday nights are our quiz nights, and we normally head up to the venue (The Hill on Cotham Hill) nice and early to enjoy one of their amazing pizzas before the quiz begins. To try and make myself feel better about it, though, I made my own flat bread pizza for dinner before heading out. 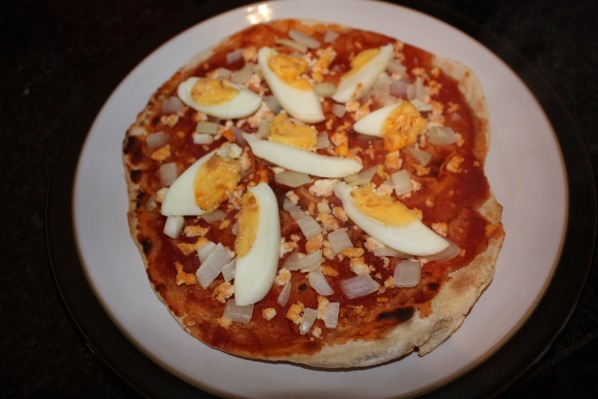 One flat bread, topped with carefully weighed portions of passata, onion, homemade paneer cheese (using milk and lemon juice) and a hardboiled egg came in at 29p in total. Nowhere near the same as one of their amazing pizzas, but at least it was fairly filling. I intentionally turned up late to the pub as I didn’t want to watch the others eating while I couldn’t! Sadly, though, they ordered late, so I DID have to sit and watch…no fun at all. It wasn’t much fun sitting in the pub drinking tap water throughout the whole of the quiz either, to be honest. I think I’ll be having several more nights in than normal this week. Great work – that food looks pretty good. Sure it will get old quick though. I actually had a go at making some flat breads today. Pretty good but found one side cooked better than the other. Also haven't got a rolling pin so had to use a tin of baked beans. What is your method? Presumably it doesn't involve baked beans? Going to mix it up a little tomorrow…but it's odd having nothing to season my food with! Well done so far 🙂 You’re doing really well! You’ll have to tell me how you made your paneer cheese, I’ve always wanted to make some for curry nights!